Mass will be held regardless of the weather. It will only be cancelled if there is a serious safety issue. Always check the website for the latest information. 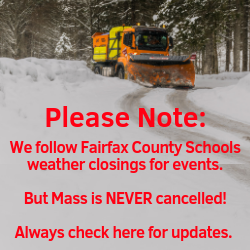 St. Philip follows Fairfax County Public Schools weather delays and closings for activities and religious education classes. The Early Childhood Center follows Fairfax County Public Schools for weather delays and closings. During inclement weather, our rectory office follows the Federal Government Operating Status. If the Federal Government is closed or operating on a delay, our rectory will follow the same schedule. Always check the website for the most current information.